IBC2018, the world’s most influential media, entertainment and technology show, today announces the line-up for the IBC Future Zone and IABM Future Trends Theatre. Well established as part of the IBC Exhibition, from 14-18 September, the Future Zone brings together the very latest ideas, innovations and concept technologies from international industry and academia and showcases them in a single specially-curated area sitting alongside exhibition Hall 8. This year, the focus is on showing how new technologies grow from their first inception and progress through to research, development, and validation projects; right through to maturing into the ground-breaking applications and future product standards. Major industry trail-blazers presenting their visions of the future, include Japan’s NHK and BBC R&D from the UK. Both companies will demonstrate a number of technology advances, including: Web-VR applications; object-based media scenarios; pathways to 8K resolution for UHD; and Artificial Intelligence in broadcasting. Internationally-renowned French research institution B-com will show innovative uses for Augmented Reality and new audio/video production workflows. Research foundations ETRI from South Korea and Germany’s IRT, who are contributing as part of international collaborative research projects, will demonstrate the object-based broadcasting of major sports events, 'smart stadium’ technologies, and the world’s first intercontinental ultra-wide vision (UWV) transmission between South Korea and the Netherlands. Audio, an important but often over-shadowed component in the broadcast world, takes a prominent role in this years’ Future Zone. 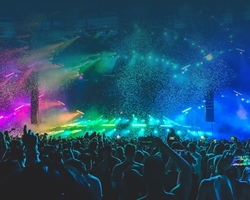 Spatial audio solutions have progressed significantly over the last year. On the video side, 4K UHD is already establishing itself in the marketplace. Various implementations of UHD technology standards will be shown on the UHD Forum stand, including end-to-end OTT HDR systems and new academic research into high contrast HDR techniques. This includes an app that enables attendees to see some astounding quality special HDR content on their mobile phones. A key competent of IBC’s Future Zone footprint is the IABM Future Trends Theatre. The packed programme of 60, 20-minute, presentations will explore up-and-coming technology and business trends and how they will segue from today’s environment. Executives from companies including Hexaglobe, videomenthe, Prime Focus Technologies and Blue Lucy will present on a range of topics including AI, cloud business models, new-age content supply chains, and blockchain.